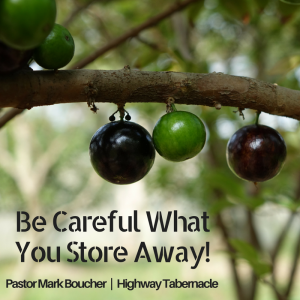 Be Careful What You Store Away! The Lord wants good fruit from our lives! While reading Luke this week, I pondered the lesson from Jesus about the trees and their fruit. Jesus said, “No good tree bears bad fruit, nor does a bad tree bear good fruit. Each tree is recognized by its own fruit…” (Luke 6:43-44a). And so, my natural question is “How can I be a good tree, bearing good fruit?” The more I grow in the Lord, the more I realize the importance of “pruning.” Pruning is the cutting away of that which is unimportant to allow what is essential to grow and flourish. When Jesus speaks of a “good tree,” we know from other Scriptures that only He is the source of this goodness. Salvation is Jesus washing our hearts from sin and declaring us forgiven, not guilty, before God. This is grace! Pruning is the surrender and discipline I offer the Lord because of His grace given to me. In other words, God’s grace in my life does not mean I have no involvement in growing good fruit. Jesus goes on to describe the process of growing good or bad fruit. “The good man brings good things out of the good stored up in his heart, and the evil man brings evil things out of the evil stored up in his heart” (Luke 6:45a). If we truly belong to God, and are called a “good tree,” we will cooperate with God by making sure we store up good in our hearts. Okay, let’s get practical. If you’re a follower of Jesus, you make daily decisions. What will you watch on the TV or PC? What kind of music will you listen to? What type of material will you read? Who will you choose to listen to? For, what passes through your eye and ear “gates” gets stored in your hearts. If you wonder why God tells us over and over again to read, study, and meditate on His Word, it’s because He wants us to be filled with His thoughts and to turn from evil. From good thoughts come good fruit. From evil thoughts come bad fruit. The concept is easy. However, the practice takes God’s power, blended with our self-discipline! In the end we will present the fruit of our lives as gifts to the One who gave us the greatest gift…eternal salvation through Jesus Christ! If you watched a day’s worth of commercials on TV you would discover all kinds of answers to “finding life.” Buy the right car! Purchase the perfect skin cream! Eat this delicious food! Hire an amazing attorney to get the money you deserve! On and on it goes. 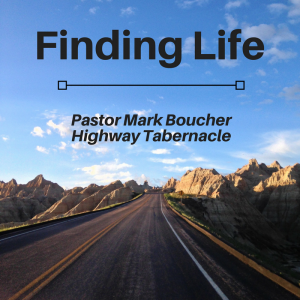 One day Jesus spoke to a group of self-assured leaders about finding life. They believed in their superiority over others because of their involvement in the right activities and connections with the right people (while despising the “bad” people). Jesus said to them, “Yet you refuse to come to me to have life” (John 5:40). Even though they believed they had “found life,” they were lost. Someone defined “lostness” as doing a lot of activity…with no purpose. As I read the encounters Jesus had with people like this, I ask myself, “Why in the world would they refuse to come to Jesus?” The answer is found by simply looking around and looking within. Why don’t more people come to Jesus today? Could it be the exposure factor? If the average person is exposed to hundreds of “commercials” about the meaning of life and yet hardly ever hears God’s Word, what will they choose? Many people have only a “cartoon version” of Christianity, and perceive following Jesus as a repressive life, missing out on “all the fun.” If you are a believer in Jesus, you have discovered that Jesus is truly “the way, the truth, and the life” (John 14:6). To walk with Jesus is to know the secret of “abundant life” (John 10:10). So, how can we help others who are lost? Let’s start by making sure we don’t lose sight of Jesus ourselves. Paul told Timothy, “Watch your life and doctrine closely. Persevere in them, because if you do, you will save both yourself and your hearers” (1 Timothy 4:16). Be responsible for yourself first. You must lead yourself in the ways of Jesus before you can point others to the way. Today, I was driving on the highway and saw a tow truck on the side of the road behind a car that needed assistance. However, when I got closer, I noticed the tow truck’s front tire was shredded down to the metal rim! The tow truck wasn’t going anywhere until it first received help. In summary, true life is found in Jesus! To help others find life in Jesus, we need to stay close to The Life Himself. 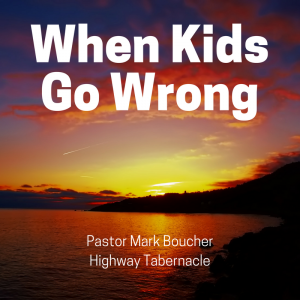 Why do kids blessed with godly parents sometimes choose a pathway of evil? King Hezekiah was a great and godly king who reigned in Judah (you can read his story in 2 Kings chapters 18-20). His son, Manasseh, however, jumped headfirst into the cesspool of sin. The Bible says, “He did evil in the eyes of the Lord, following the detestable practices of the nations the Lord had driven out before the Israelites…Manasseh led them astray (the people of Judah), so that they did more evil than the nations the Lord had destroyed before” (2 Kings 21:2,9b). Here we see a young king sprinting toward self-destruction…and the ruin of his nation. Today, your heart may be breaking over a child who has rejected truth and is continuing to make one bad decision after another. You ask, “What will it take for him (or her) to come back to God?” In the case of Manasseh, God allowed him to experience the bitter fruit of his choices. The Scriptures tell us, “The Lord spoke to Manasseh and his people, but they paid no attention. So the Lord brought against them the army commanders of the king of Assyria, who took Manasseh prisoner, put a hook in his nose, bound him with bronze shackles and took him to Babylon” (2 Chron. 33:10-11). Try to imagine going from a throne to a torture chamber! The Babylonians treated captured kings with the most extreme pain and humiliation. Manasseh was led around like an animal on a leash, which was connected to his face with a hook through his lips! I don’t pretend to understand everything about how God works with wayward children, but I do know that God allows us to come to a place of desperation. Sometimes, personal pain is the only thing that will get our attention. In spite of all Manasseh’s woes, his story ends on an encouraging note. “In his distress he sought the favor of the Lord his God and humbled himself greatly before the God of his fathers” (2 Chron. 33:12). In his mercy, God actually restored Manasseh to his kingdom. Don’t give up praying for your rebellious child. The last chapter hasn’t been written yet. And let them know you are praying for them and are there for them.